Also: which games will get on prime time in 2019? And a quick review of Seattle's tailback depth heading into the offseason. Catching up on a few more questions in our latest Seahawks mailbag, including looking again at a topic that figures to dominate the offseason conversation — do the Seahawks run it too much at the wrong times? Questions are from both email and Twitter, and as always you can send in yours at bcondotta@seattletimes.com or via Twitter at @bcondotta. Q: Does the Seahawks’ approach for running the ball first not help them when down by at least two scores late in the fourth quarter? From what I saw from the Cowboys game in the playoffs they scored too little, too late and the Chargers game when they scored late in the fourth quarter but didn’t have a lot of time either. It feels like the approach isn’t working and needs a change when behind by two scores in the fourth quarter and they don’t let (Russell) Wilson take over to help them rally. Instead, they continue to ground and pound and that takes too much time. A: I’ve gotten several different versions of this question again over the past week or so — basically asking why the Seahawks don’t throw more when they are behind. So I figured it was worth another look. I broke down the numbers from the Dallas game last month. As I wrote then, it’s not accurate to say that the Seahawks just kept running it once they fell behind. Down 17-14 with 12:28 left, Seattle ran it only one more time, passing on 11 of 12 plays in the fourth quarter. 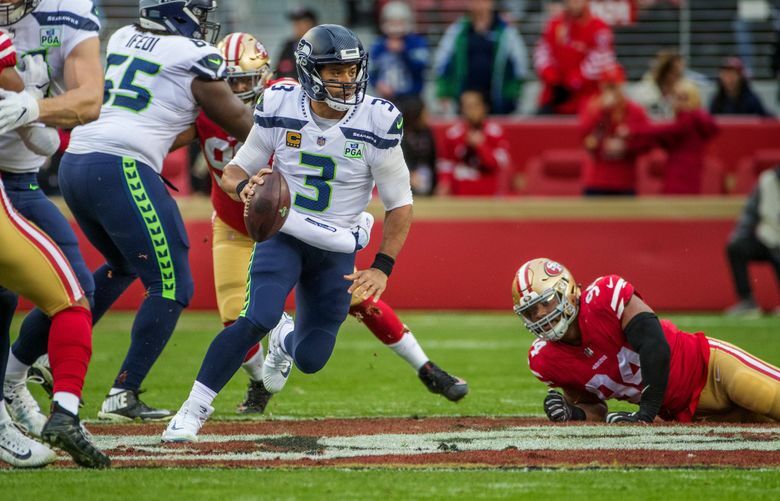 Seattle had a 14-10 lead entering the fourth quarter, at which time it had run the ball 23 times compared to 16 passes, 58 percent, which is not too far off the 52.5 run percentage the Seahawks had overall in 2018. The Seahawks actually passed it 11 times compared to 10 runs in the first half and were at exactly 15 of each midway through the third quarter before running it on eight of nine plays on what was the only touchdown drive of the first three quarters, a nine-play, 44-yard march that put the Seahawks ahead 14-10 with 1:59 left in the third quarter. The order of Seattle’s runs and passes — that it did too much running on both first and second down to leave it in third-and-longs — has been heavily discussed (including here by 538.com). And as I wrote in January, the run-run-pass sequence didn’t work too well against Dallas. The Seahawks went run-run-pass six times in the first half with five of those resulting in third downs of 6 yards or longer, none of which the Seahawks converted. That was part of a 2-for-13 third-down conversion rate Seattle coaches cited later as the most significant factor in their offensive struggles. But that’s a separate issue from saying Seattle didn’t adjust its play-calling when behind. As I’ve written a few times, I think Seattle’s sticking with the run in the first three quarters can be understood more clearly in realizing that the Seahawks were just sticking with what brought them there. And with a 14-10 lead early in the fourth quarter, they had reason to think the plan was still working, if maybe more tenuously than they had hoped. Seattle was the most run-heavy team in the NFL this season, and particularly so after the first two games. After an 0-2 start in which Seattle passed 69 times while running it just 38, the Seahawks decided to rededicate themselves to the run. They ran it more than they passed in all but two games the rest of the way, going 10-4 in that span and scoring 24 or more points 10 times in averaging 26.8 points per game — sixth in the NFL and just one point per game behind eventual Super Bowl champion New England. Seattle averaged 30 points a game in the final eight games of the season, trailing only the Chiefs (34.0) and Rams (32.6). So, if the Seahawks were a little stubborn against the Cowboys, they had some reason to want to stick to a plan they’d seen work in previous games. Coach Pete Carroll said many times in the final few months of the season he regretted that the Seahawks got away from the run as quickly as they did in the first two defeats — at Denver and Chicago. And if we’ve come to realize anything about Carroll, it’s that he’s pretty firm in the beliefs he has. While Carroll later acknowledged the run wasn’t working as well as they’d hoped against Dallas, in part because he underestimated the impact of the injuries on J.R. Sweezy and D.J. Fluker in muting the effectiveness of the run blocking, in the moment he undoubtedly thought about what he considered the mistakes of the first two games and wanted to stay true to what Seattle had done to get to a 10-6 season in the first place. But as noted above, the Seahawks did adjust once they were actually behind in the game. As for the Chargers’ game, that’s one that I think the numbers might reveal a little different story than what the questioner suggests. Seattle came out running in that game, per usual, running on nine of 13 plays on a 75-yard touchdown drive to open the game and take a 7-0 lead, though the touchdown came on a 10-yard pass to Jaron Brown on first down. But the Chargers quickly regained control of that game, and once they did, the numbers show Seattle did adjust. Once Seattle fell behind 19-7 in the second quarter, the Seahawks changed things up. They mostly threw it in the second quarter, finishing the first half with 17 runs and 17 passes at which point the Chargers led 19-10. The Seahawks had a 14-10 pass-to-run ratio in the second half at the point when Wilson threw a pick-six that put the Chargers up 25-10 with 6:44 to play (and 13 passes to eight runs before that series). From that point on, Seattle threw it on 19 of the final 24 plays. The furious rally almost brought Seattle back and maybe makes it look like Seattle should have always played that way, though the Chargers would counter they were playing in a different defensive mode at that point and happy to let the Seahawks hunt-and-peck their way down the field by whatever measure they wanted just as long as it took time off the clock. Regardless, I think the numbers show Seattle did adjust once behind in each game. As for the Dallas game, questions will always linger about what the Seahawks did until that point. The Chargers finished 12-4 and were one of the better teams in the NFL all season. That one looks mostly like the better team winning. You think the Hawks will keep Bo? Any free agents you think they might pick up? A: I’m assuming you mean Bo Scarbrough, a running back the Seahawks signed off Jacksonville’s practice squad late in the season? He actually is under contract through the 2019 season, so he’s in the fold. And while some questioned why Seattle signed Scarbrough and then never played him — he was inactive for the final two regular-season games and the playoff game — I think this also was a move made with the future in mind and the desire to add some depth at that spot. Mike Davis now is an unrestricted free agent and might not be back and Scarbrough figures to add to the competition behind Chris Carson and Rashaad Penny (each remaining under contract for at least two more years) and probably J.D. McKissic, who is a restricted free agent but a player it’s assumed Seattle wants back. Scarbrough has yet to play in an NFL game after entering the draft last year following a solid career at Alabama. He was drafted and then waived by Dallas and then later signed to Jacksonville’s practice squad after clearing waivers. Seattle signed him to its 53-man roster in the wake of some injuries in the backfield and wanting to assure it had the depth it would need to get through the rest of the regular season, and at the time also hoping for a long playoff run. As for free agency as a whole, we will have a lot of stories on Seattle’s needs and potential targets as the free agency period nears March 13. Prediction for Seattle's 2019 primetime games? A: Interesting question! Those all seem like good guesses. I might switch out the Baltimore game, though, for Seattle’s visit to Cleveland and Baker Mayfield. I think there’s no doubt the Browns will get all five prime-time slots next year to try to capitalize on Mayfield and what appears to be a resurgent team, and a network might also love to play up the relationship between Wilson and Mayfield created when Mayfield appeared on Wilson’s QB2QB show last year before the draft. And if Richard Sherman stays with the 49ers, and if Earl Thomas were to end up there, then either of the two Seattle-San Francisco games would also be pretty enticing. Seattle got the max five prime-time appearances in 2018 when the schedule was originally announced before the home game against the 49ers was later flexed out of Sunday night when San Francisco fell apart following the injury to Jimmy Garoppolo. But I still think the networks will be intrigued by the 49ers heading into 2019. We’ll likely find out some time in late April. If the league keeps to what it has done the past few years, then expect the schedule to be announced the week before the NFL draft, which is April 25-27.